I predicted, in this post, during the 2016 presidential election, that because Donald Trump and Hillary Clinton were the two most disapproved and disliked candidates running for president in history, whoever won would become the most disapproved [in poll numbers] president [during their four year term] overall since polling began. 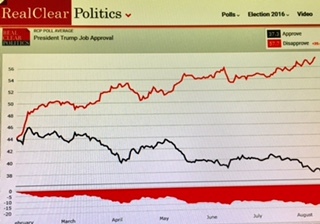 While we are only into the 7th month of this presidents first term in office, I believe the Real Clear Politics polling averages are starting to support my hypothesis. The President's highest approval average in these 7 months was on Feb. 4, 2017 at 46%. On that day he also enjoyed the lowest negative spread of approval at -2.3%. It has been downhill ever since, where today, August 15, 2017, Donald Trump has reached a new low approval rating of a dangerous 37.3%. At the same time the president's approval has reached a new low, his disapproval has reached a new high of 57.7%, nearly 6 in 10 Americans. The low in approval and high in disapproval number translates to a new low spread of -20.4%. I know when I report these numbers many of the Trump supporters will immediately say, 'fake news; these are the same polls that were so wrong in the 2016 presidential election.' But as I have pointed out in this post, "The Myth of the Bogus National Polls", that is a myth that the average of "national polls" were so far off. The final Real Clear Politics average of the national polls predicted that Hillary Clinton would win the national vote by 3 % and she ended up winning by 2%. So, while some of the individual state polls were off and most of the pundit predictions of the election results were off, the average of the national polls was amazingly close once again as displayed in Real Clear Politics. That is why the low poll approval rating of the president, which has reached an even new low, should be disturbing to the Republican Party.